Welcome to Sunset House Bed and Breakfast. We are nestled in a charming residential neighborhood just three blocks from the beach and a half-block from the area shops, restaurants, and art galleries. Our great location and spacious suites offer privacy from the hustle and bustle of the busy streets. The peaceful sounds of the Pacific Ocean contribute to a world of tranquility. A crackling fire in your wood-burning fireplace offers the soothing close to a fun-filled day. 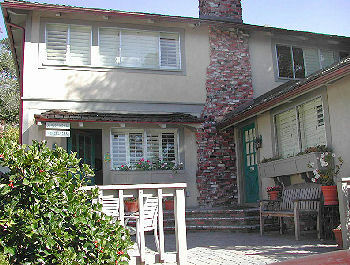 Sunset House is the perfect haven to complete your beautiful Carmel-By-The-Sea experience. We also offer the option of driving the classic auto of your choice, based on availability. Some conditions and restrictions apply. Sunset House welcomes guests and their four-legged family members with a complimentary gift basket for each. Our goal is to make your stay as wonderful as we can. Let us know if we can do anything special for you.